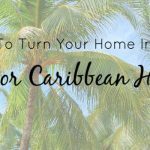 When decorating a beach house, you can have a subtle coastal theme or you can have the traditional nautical look of navy blue and white, jute rope and sea glass decor. The quintessential nautical style has a timelessness to it. It is easy to go overboard with this style, so we suggest some well-placed items to finish the maritime look. We hand-picked decor pieces and ideas to help get your ship sailing into the right direction and on your way to a beautiful seagoing space. 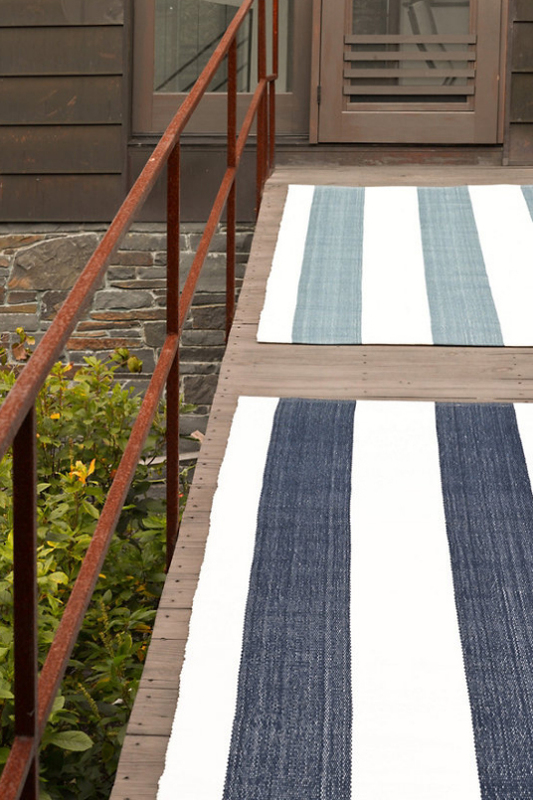 It’s simple to add that maritime feeling to any space – indoors or out – by adding stripes. Navy blue and white stripes are as nautical as you can get. Not sure you’re ready to commit to a full on nautical look? Why not add an easy area rug? Our Lakehouse rugs are for all seasons, made to endure high-traffic areas and muddy messes, plus you can just hose them off for easy cleaning. 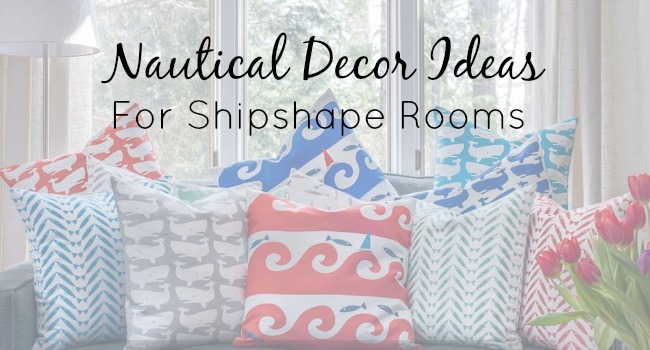 Adding coastal themed accent pillows bring whimsy to your nautical decor. 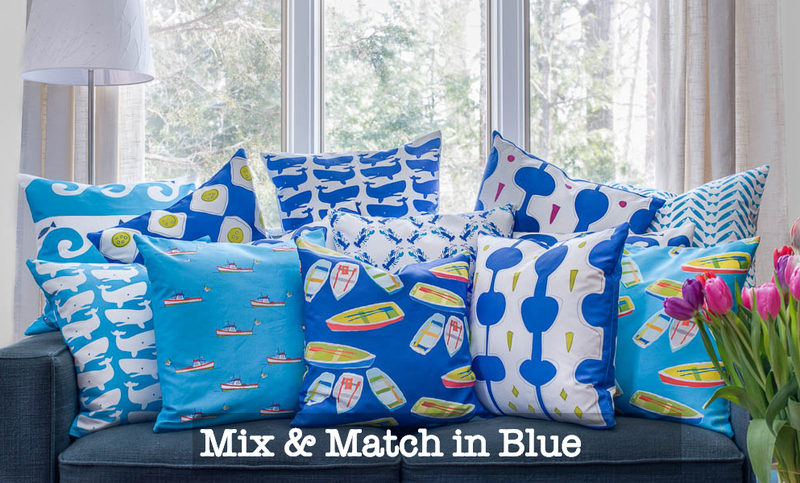 Choose your color scheme and mix and match until your captain says “Aye!” Start with our Fun Whales White on Blue Pillow, fabric is designed exclusively by Trösko Architecture & Design and printed in the US with eco-friendly inks, then fill in your space with more fun pillows with sea-worthy patterns and you’re set! Anchors aweigh! 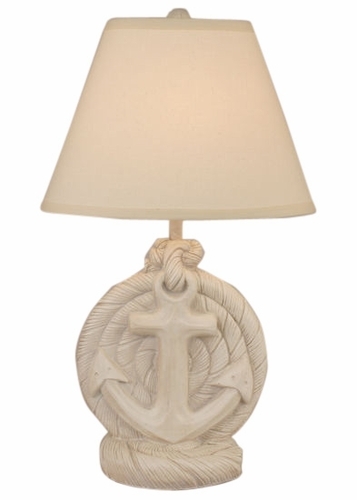 Nautical spaces would not be complete without an anchoring element – such as this Anchor Table Lamp with Antique Light Finish. 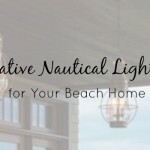 Introducing anchors into your beach home decor will not only give that special touch to make the nautical look complete, it’ll will keep you grounded. 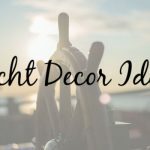 There is no end to ideas for updating with a nautical decor style. In fact, we’ve created a Pinterest board to pin all the fantastic ideas out there. 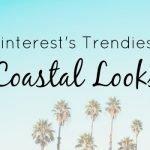 – Don’t forget about seashells! No matter how you choose to enjoy the look, nautical decor never seems go out of style and your guests will probably feel right at home too. Nautical decor is inviting and calm, even as it evokes thoughts of the sea and all that surrounds it. Be careful not to get too kitschy, it can be easy to overdo it. Simply layer in some of your favorite pieces and build from there and before you know it, your space will be shipshape ready!